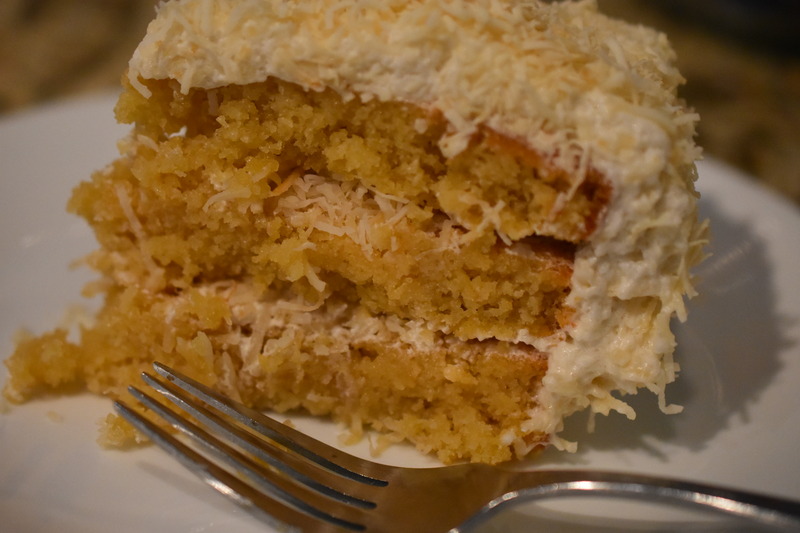 I have been thinking about coconut cake for weeks. I wanted one that was truly coconutty (I know I just made that up), not just a vanilla cake with coconut. I wanted the cake to be full of coconut flavor and the frosting to be coconut. Thus the word, Coconutty. Scouring the internet for a coconut cake recipe I finally found one that I could adapt to our way of eating. Remember, it has to be gluten-free and with no refined sugars, yet taste just as amazing as a more traditional cake. The first time I made this cake it was just okay. It was a too sweet and I did not like the crumb of the cake. Initially the recipe called for egg whites. Because I use paleo flour, flour without gluten the structure of the cake did not hold up well. I even tried using gelatin, probably too much, but it still did not produce the kind of cake that I wanted. It was also too sweet. By adjusting the sweetener significantly it had a more palatable and divine taste that I expect from my desserts. Also, the coconut was to be plain, no toasting involved. I knew when I was going to rework the recipe that was going to be changed too. Toasting the coconut brings out the flavor so much more. It just makes the coconut so much better. Now with some adjustments it is perfect. My husband said it was recipe worthy. That is high praise. The frosting is light and airy as a cloud, of course with coconut – Yum. It is basically a 7 minute frosting and totally worth the effort. A stand mixer would be a big help in whipping this frosting to its airy and glossy peaks. When I look at this cake I think of snow and Christmas. I hope you enjoy this cake as much as we did. Idea: This recipe would make really cute cupcakes with marshmallow snowmen on each top. Line three 9-inch round cake pans that have been greased with parchment paper. Preheat oven to 350 degrees. In another bowl whisk together flour, baking powder and salt; add dry mixture to wet ingredients. Mix well. Distribute cake batter evenly into the three parchment lined pans. Bake for about 17 minutes, until cake tester comes out clean. Remove from oven and cool in pans. Line a sheet pan with parchment paper.Spread out coconut evenly onto parchment paper. Toast in oven for about 5 minutes, or until golden brown. Remove from oven and set aside to cool. In a large heatproof bowl, whisk egg whites, honey and cream of tartar over a large saucepan of simmering water. Whisk mixture continually, until a thermometer reads 160 degrees. remove from heat; add coconut and vanilla extracts. Beat mixture until stiff and glossy peaks form. Frost top of first layer of cake. Add coconut. Repeat with the two other layers. Frost sides and cover cake with coconut. Refrigerate uncovered. Me too. It turned out perfect. Thank you mistimaan. It is a new one for my files.